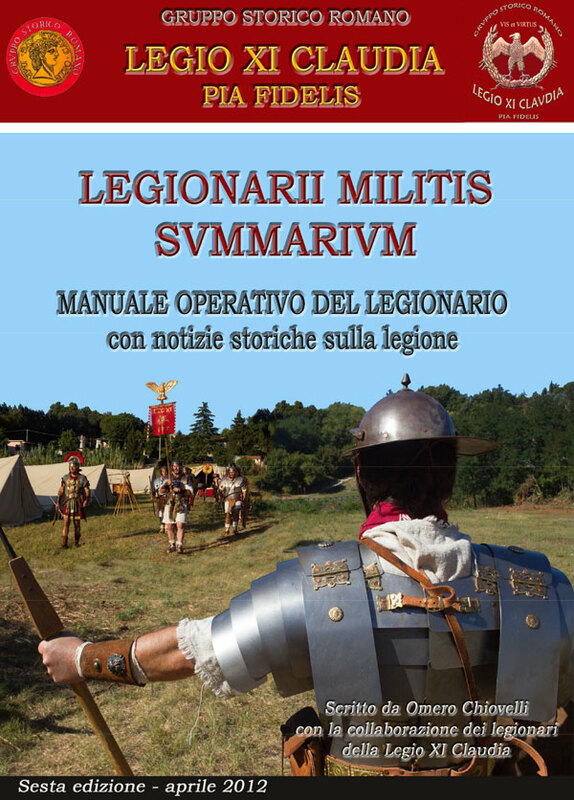 The sixth edition of the Handbook of the Legionaries, published by Gruppo Storico Romano in ‘April 2013, contains historical information about the Roman legion, its armament, its constitution and its evolution over time of the foundation of Rome to the end of his empire. Explains military maneuvers, formations of attack and defense, and the way to fight the ancient Roman legionaries and defines the maneuvers and formations similar, made ​​by the Legio XI Claudia modern rebuilt. It also shows historical information on the Roman castra, the fortified camp of the Roman army and defines a reconstruction of the sacramentum, an oath of allegiance to Rome and the Emperor of the legionary. The volume can be purchased at the Gruppo Storico Romano at the price of € 25. (currently available only in Italian).